Jeff Meldrum is Professor of Anatomy and Anthropology at Idaho State University in Pocatello. 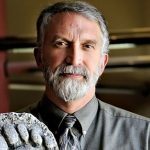 He has published numerous academic papers ranging from vertebrate evolutionary morphology, the emergence of bipedal locomotion in modern humans, to footprint evidence of another bipedal primate species in North America, known as sasquatch. Jeff Meldrum is the author of "Sasquatch: Legend Meets Science" and co-editor of "From Biped to Strider; The Emergence of Modern Human Walking, Running, and Resource Transport"